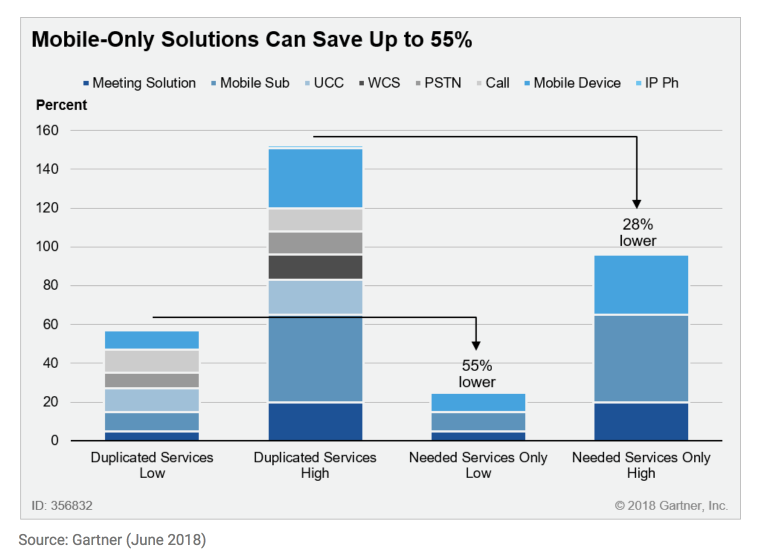 A mobile phone for calling and messaging, in tandem with a meeting solution, can meet most employee requirements; potentially saving up to 50% per user per month, says Gartner. The assertions were made in a research paper: Cost Optimisation: The Mobile Phone Is the Only Phone the Digital Workplace Employee Needs, which was published on on 5 June 2018, by Katja Ruud, Steve Blood, and Rafael A Benitez. Digital workplaces require three essential communications elements: calls, messages and meetings. In an effort to ensure that all employees have access to the necessary productivity tools, enterprises tend to make blanket deployments of features and applications. A mobile subscription for calling and messaging, in tandem with a meeting solution, can meet most enterprise voice and collaboration requirements. This could mean savings of up to 50% per user per month, compared with the current UC environment. It is crucial that application leaders identify the elements of their workforce that would be most appropriate for a mobile-only strategy, says Gartner. Replacing UC and fixed voice access with mobile is likely to be more applicable to so-called non-routine or creative work. This could include employees in design, marketing, engineering, sales - any role that is hot-desking or remote-working. Most organisations will be able to replace UC and fixed voice with mobile solutions to a greater or lesser extent. Further, it is likely that all organisations will be able to take some costs out without compromising functionality. Even in the enterprise profile with lowest percentage of non-routine workers, they still constitute some 25% of the total workforce. Gartner estimates, more than 90% of all enterprise mobile users globally have access to unlimited voice plans and features like messaging and voicemail. Mobile pricing also continues to decline by about 5% to 10% each year, meaning that the price difference between mobile and fixed line costs continues to narrow. Thus, mobile usage is no longer expensive in real or relative terms compared with competing services. But a failure to purchase unlimited voice plans can compromise cost optimisation. VoicePlus is a Gartner associate and the only Australian vendor to be included in the Gartner 2017 Telecom Expense Management Market Guide. Atrium has a proven track record with leading Australian enterprises including Coca-Cola Amatil, KONE, Weir Minerals, CNH Industrial and Specialty Fashion Group.